An apparently fraudulent letter is causing friction between two industry groups. The letter purports to be from former Sen. Tim Johnson (D-S.D.) to Richard Cordray, director of the CFPB. 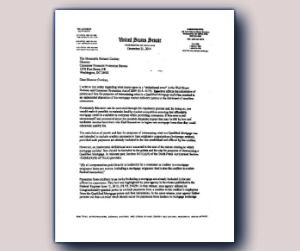 Dated Dec. 21, 2014 – before Johnson left office – the letter regards a possible “definitional error” in the Wall Street Reform and Consumer Protection Act of 2009. The letter states that Congress did not intend to count compensation paid by creditors to mortgage brokerage firms toward the 3% points and fees cap for qualified mortgages. National Mortgage News published a story on the letter on Jan. 16. The story stated that the letter had been provided to the publication by the National Association of Mortgage Brokers. As the chairman of the Senate Banking, Housing and Urban Affairs Committee, Johnson swung real weight, and his opinion might convince the CFPB to modify the compensation rules, Savitt said. There was only one problem: the letter was apparently a fake. “(It) appears that the letter is not factually correct or authorized by the senator,” Smith wrote. The CFPB also confirmed that it had not received the letter in response to an inquiry from MPA. Savitt then reached out to Drey Samuelson, Johnson’s longtime chief of staff. “I can confirm that the letter in question was neither authorized, signed, or sent by Senator Johnson,” Samuelson wrote on Feb. 12. Samuelson also responded to an MPA inquiry, confirming again that the letter was not written or authorized by Johnson. In fact, the letter seems to have been written by a phantom. No one seems to have seen it before NAMB sent it to National Mortgage News. Savitt contacted NAMB president John Councilman and asked where the association got the letter, but got nowhere.